Brand New Fuel Pump (with filter). Fits Ford / New Holland Tractors and Loaders. LS180, LS190, LX865, LX885 and others. Please verify all specs / info / applications shown below for fitment. 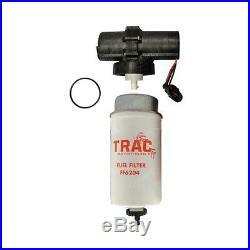 Uses TRAC filter # FF6203 (replaces 87801434) - Filter is included with this pump. Replaces OE #'s 87802202 and 87802238 on applications shown below. Ford/New Holland - 1089 BALE WAGON, 1095 BALE WAGON. 2550 WINDROWER, 555E LOADER, 5610S, 575E, 655E, 6610S. 675E LOADER, 6810S, 7010, 7010S, 8010, 8160, 8260, 8360, 8560. L865 SKID STEER LOADER, LB110 LOADER, LB115B LOADER. LB75B LOADER, LB90 LOADER, LS180 SKID STEER LOADER. LS190 SKID STEER LOADER, LX865 SKID STEER LOADER. LX885 SKID STEER LOADER, LX985 SKID STEER LOADER. TB100, TB110, TB120, TB80, TB85, TB90, TM115, TM120, TM125, TM130. TM135, TM140, TM150, TM155, TM165, TM175, TM190, TS100, TS110. You can find out more about me and my business by checking out my. Unbeatable Customer Service Is Guaranteed! I appreciate your business and I act like it! I treat people the way I want to be treated. I describe each item as accurately as possible, letting you know of any defects that I see. Please feel free to contact me at any time with any questions you may have. I do everything within my power to make sure each item is received in the same condition as when it left my hands. We might even be able to extend that on a case by case basis. We will do all we can to make it right. The item "Fuel Pump / Filter fits Ford New Holland Skid Steer Loader LS180 LS190 LX865 885" is in sale since Monday, March 6, 2017. This item is in the category "Business & Industrial\Heavy Equipment, Parts & Attachments\Heavy Equipment Parts & Accessories\Tractor Parts". The seller is "lyerlybill" and is located in Lyerly, Georgia. This item can be shipped to United States.